A two-hour train ride from Tokyo transported us to the mountainous town of Hakone within Fuji-Hakone-Izu National Park. This area is popular with locals for its hot springs resorts, referred to as onsens, and is home to the world-famous Yunessun Spa and Resort. Yunessun is a multi-level waterpark, hotel and retail complex situated in the mountains. The main attraction is a number of hot spring-fed pools mixed with popular beverages. Accommodation is available at Yunessun or neighboring hotels associated with the spa. We elected to stay at Hakone Kowakien Ten-yu and were wowed by the experience. While English wasn't prevalent, the luxury hotel provided an authentic Japanese experience. The rooms were ryokan style, traditional Japanese accommodation originating in the 8th century characterized by tatami-matted floors, cushioned ground seating, communal baths and public areas were visitors wore yukata, or closed robes, and geta, wooden sandals. The stay included half-board, dinner and breakfast, both of which may have been the finest, multi-course meals we enjoyed during our visit to Japan. While in Hakone, we spent an afternoon at the Yunessun Spa. Crowded with families and young couples, we were surprised that there were only a handful of people who appeared to be foreigners. We flew down the water slides at the park and watched synchronized aerobics in the central pool, before taking a dip in the famous mixed baths. 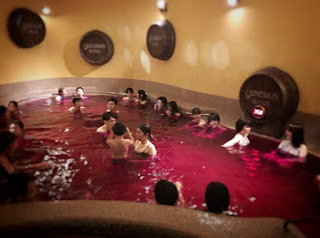 The beverage baths available were coffee, red wine, green tea and sake with each varying in temperature and color. Aside from the overwhelming aroma, the coffee pool was our favorite and left our skin feeling especially soft. We also peaked into the mori no yu area of the resort where swim suits are forbidden and bathing is segregated by gender. The beautiful town of Hakone offers much more to see and do besides the spa. We didn't have time to sail across Lake Ashi on a pirate ship, walk across Mishima pedestrian bridge to gaze at Mount Fuji or sample the black hard boiled eggs said to add seven years to your life, but we did make a note for next time before heading back to the big city.